Arunachalknowledge Arunachal Pradesh Historic Day for Arunachal Pradesh. The Arunachal Pradesh will witness historic landing of first commercial flight at Pasighat airport. The 21st May, 2018 will be a red letter day in the history of state. The new flight will operate to and fro thrice a week on the Kolkata-Guwahati-Pasighat route on Tuesdays, Thursdays, and Saturdays. When the ATR plane of Alliance Air carrying passengers including Chief Minister Pema Khandu lands at Pasighat it will start a new chapter in the history of aviation sector. Hopefully, this will lead to better future for the state. It is booming time for aviation sector, as besides Pasighat, the Tezu airport is also expected to start commercial operation by end of this year. The improvement in air connectivity will help to boost tourism sector. There should be more flights from Pasighat and Tezu airports to cities like Delhi, Chennai and Mumbai. Many Arunachalees visit these cities for medical and educational purposes. Also the government of Arunachal should rigorously pursue ministry of civil aviation seeking early start of the green field airport in Itanagar. It is a matter of extreme shame that Itanagar continues to be the only capital in whole of India not to have an airport of its own. 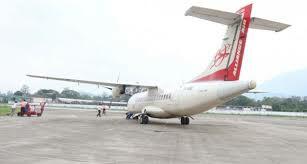 People of capital region are still depending on Guwahati airport for the air connectivity. For now every Arunachalee should rejoice the news of commercial air service starting at Pasighat airport. It is matter of great pride and joy for the people of the state. 0 Comment to "Historic Day for Arunachal Pradesh. "